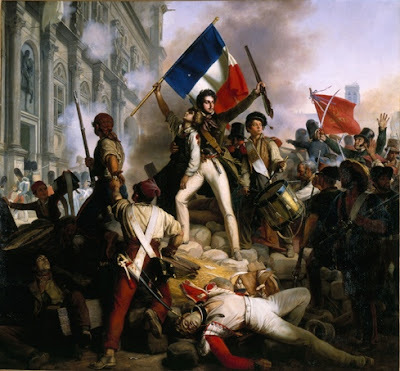 People have defined themselves politically as being on the right or left-wing since the French Revolution (Back then the definition related to the fact that the Royalist sat on the right of the French parliament and the Revolutionaries sat on the left). However, some now question whether current definitions are too simplistic to describe modern political views. I came across this quiz (from 2005 but it still works), which adopts that viewpoint as its premise. It takes around 5 minutes to complete and your answers will be plotted onto a graph and compared to YouGov opinion surveys as well as other participants’ answers. Without getting into the debate on the viability of left-right definitions; I do think this is a fun quiz for a Sunday. Click here if you fancy giving it a go. hi! love your blog. what's the name of that painting from the french revolution? and the painter? thank you! I would also like to know the name of the artist who created that painting.